Both front doors can be locked and unlocked with the key. Turn the key to the left to lock and to the right to unlock the door. Once a door is unlocked, it may be opened by pulling the door handle. 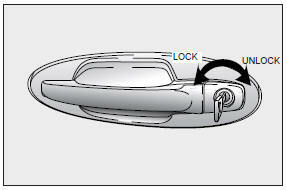 To lock a door without the key, push the inside door lock button to the “LOCK” position and close the door. 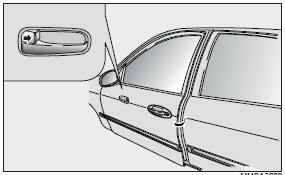 At the driver’s door, if you would unlock the other doors, you must turn the key to the right twice within 3 seconds, but all for doors can be locked by turn the key once.